During the past 25 years, the United States and other western countries have adopted a drug-based paradigm of care for treating emotional distress and other psychiatric problems. 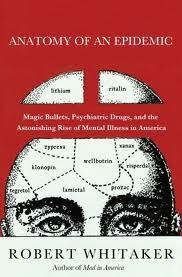 The oft-given rationale is that the drugs fix “chemical imbalances” in the brain, and thus are a necessary treatment. Yet here is the paradox: In every society that has adopted the widespread use of psychiatric drugs over the past 25 years, the burden of mental illness in that society has increased dramatically. What is going on? A review of the scientific literature provides an answer to that question, for it reveals that psychiatric medications, when used to treat major depression, anxiety, bipolar disorder, and psychotic disorders, worsen long-term outcomes (in the aggregate.). Science reveals that use of these drugs needs to be rethought. Robert Whitaker is a journalist who has specialized in covering medicine and science. His articles on psychiatry and the pharmaceutical industry have won a George Polk Award for Medical Writing, and a National Association of Science Writers’ Award for best magazine article. In 1998, he co-wrote a series on abuses in psychiatric research that was a finalist for the Pulitzer Prize in Public Service. He is the author of four books. His most recent ones are Mad in America: Bad Science, Bad Medicine, and the Enduring Mistreatment of the Mentally Ill & lAnatomy of an Epidemic: Magic Bullets, Psychiatric Drugs, and the Astonishing Rise of Mental Illness in America.